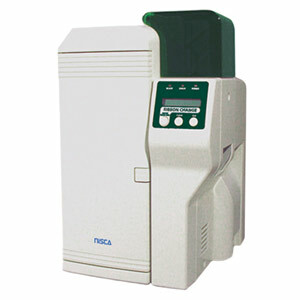 The Nisca PR5350 card printer with optional lamination. Has all of the great features found in the Nisca PR5310, but with the addition of a 30% faster print speed! The PR5350 prints 158 cards per hour. Comes with 2 year warranty and 1 year loaner! 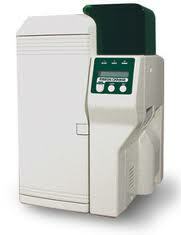 Nisca’s PR5350 has replaced the PR5300 ID card printer. Nisca‘s PR5350 duplex ID card printer packs state of the art engineering, and ISO-certified quality, into a space saving printer, that delivers industry leading 24-bit color production, and security and laminating options. With the addition of magnetic stripe encoding, IC chip encoding, and RFID reading and encoding functions, the Nisca PR5350 produces plastic ID cards that meet virtually all security requirements. With a production speed of 158 dual-sided, edgeless, YMCKO full color cards an hour, the PR5350 is the ideal printer for making corporate ID cards, government IDs, driver’s licenses, access control, event and transportation passes, and more. With the Nisca PR5350, professional quality, state-of-the-art design, and security are all available, at a very low cost per card, and being extremely user-friendly, the PR5350 offers automatic cleaning, a quick-change printhead, and easy-to-use LCD display screen. 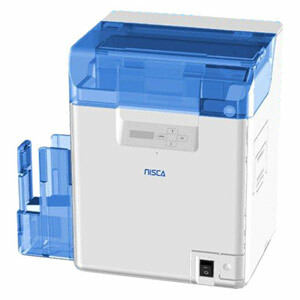 The Nisca PR5350 ID card printer is an environmentally-conscious printer, being ISO 14001 Environmental Management System (EMS) certified, and it meets the advanced Japanese and European non-lead Restrictions of the Use of Hazardous Substances (ROHS) product requirements. After printing a secure ID badge using your Nisca ID card printer, attach your ID badge with an ID Badge Clip from ID SuperShop. Add lamination printing with Nisca’s PR5302 Lamination Module. Find more Nisca ID Card Printers with ID Supershop. Print Method- Thermal transfer dye-sublimation. Resolution- 300dpi, 24-bit continous tone printing, 16.7million colors. Print speed- YMCKO: 158 cards / hour. YMCKO/K: 116 cards / hour. Accepted Card Type- PVC or polyseter cards with polished PVC finish. Accepted Card Size- CR-80 (3.375″ x 2.125″ / 85.6 x 54mm), CR-79 (3.303″ x 2.051″ / 83.9 x 52.1mm). Accepted Card Thickness- 20 – 50 mil. / 0.508mm to 1.72mm. Memory- Image: 16MB with parallel processing, four memory modes. System: 2.25MB. Display- LCD 16 character, 2-line display shows printer status and diagnostic prompts. Encoding- ISO standard magnetic stripe with dual high and low-coercivity. Communications Interface- USB 2.0 or Mico SCSI II. Dimensions- 16.57″ (h) x 10.66″ (w) x 13.03″ (d) / 421 x 271 x 331mm. Operating Temperature- 65 – 85° F / 18 – 27° C.
Power source- AC power source. AC100/240v 50/60Hz auto-switching. Agency listing- UL: UL1950: UL1950-1993. 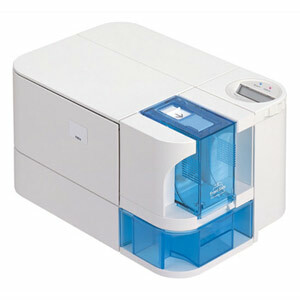 CE Class B. FCC A & B.
Warranty- 2 Year printer and printhead warranty. One year HOTSWAP. Find more Dual Sided ID Card Printers with ID Supershop.